We're doing polls this week on all three nights of Fantastica Mania at Korakuen Hall, so you can leave a thumbs up, thumbs down or thumbs in the middle along with a best and worst match for each show to dave@wrestlingobserver.com. We're also looking for reports on tonight's Raw show in Wichita Falls, TX and Smackdown in Omaha, NE to newstips@wrestlingobserver.com. Raw on Monday will be in Oklahoma City. Bayley & Sasha Banks vs. Ronda Rousey & Natalya has been announced for the show. There will also be a Smackdown house show in Topeka, KS Monday. Smackdown and 205 Live on Tuesday are from Wichita, KS. Smackdown has an in-ring segment with Daniel Bryan, Vince McMahon and A.J. Styles, plus Naomi vs. Mandy Rose, Andrade vs. Rey Mysterio 2/3 falls, Samoa Joe vs Mustafa Ali and Cesaro vs. The Miz. 205 Live has Hideo Itami vs. Kalisto vs. Akira Tozawa in a three-way. Plans for All Elite Wrestling started to come into focus at a rally in Jacksonville, Florida last Tuesday. A surprise appearance by Chris Jericho closed the event, with Jericho instantly becoming the highest profile signing AEW has made in its brief history. "I'm Chris Jericho, and I am all in with All Elite Wrestling," Jericho said to begin his speech. "Surprise -- I think we just took things to a different level, didn't we?" Jericho said he's not here with AEW for the money -- he's here because he believes in doing something new and different. The business year in review issue of the Wrestling Observer is out with looks at both the biggest drawing cards and best big match wrestlers of the modern era. This issue looks at combat sports including the biggest crowds of 2018, what main eventers headlined the most successful house shows, PPV numbers for 2018, big crowds broken down by major promotion, and UFC PPV comparisons over the last 12 years. Also have a detailed look at the new signings and negotiations over the past week. Look in depth at the battle to sign Rush, including what MLW and RHO offered, how CMLL played a role, and when Rush will be a free agent. Read the update on the Royal Rumble show, the story behind why Brock Lesnar vs. Braun Strowman was pulled from the show a long time before it got out, the real reasons why the match isn't happening and why it continued to be pushed even though it wasn't happening. Read a complete rundown of the NXT UK show, with match-by-match coverage with star ratings and poll results. Examine the success of WWE stock, the new U.K. training center, WWE women’s' tag team titles, the reasons behind some of the debuts of new characters on television, Vince McMahon's new XFL update, WWE changing hosts for WWE Network, new contracts signed, injury updates, who wants out, and the Nigel McGuinness documentary. ORDERING INFO: Order the print Wrestling Observer right now and get it delivered via mail, by sending your name, address, Visa or Master Card number and an expiration date to Dave Meltzer, or by using PayPal directing funds to Dave@WrestlingObserver.com. If you are a new subscriber ordering 24 or more issues, you can choose one free classic issue or two free classic issues with a 40-issue subscription. Conor McGregor tweeted after the Donald Cerrone win over Alexander Hernandez that he'd like to face Cerrone, which is the match Cerrone has been pushing for. Dana White didn't confirm it but it's a potential huge match. Of course anything with McGregor doesn't mean anything until the contracts are signed. TJ Dillashaw was adamant the stoppage was early. Dana White went off on the ref. He really shouldn't have. Perhaps it was a split second early, but it looked fine and certainly not anything bad enough to make a case out of. Dillashaw wants a rematch at 125 pounds. Henry Cejudo wants a shot at the bantamweight title. As far as what happens next to the flyweights, who knows. ESPN+ added 525,000 new subscribers last night for the UFC show. That's far more than WWE did for the Network for the first or any WrestleMania in one day and more than any one-day total I've ever heard of. The two-day total including Friday was 568,000 new subscribers. The prelims, headlined by Donald Cerrone vs. Alexander Hernandez, averaged a 1.4 rating in the metered markets. Full ratings will be out on Tuesday, but for Fight Night Prelims, that's the best number in at least five years. The ratings were helped greatly by following the Duke vs. Virginia game. but that would not have been the reason for the success of ESPN+, which would have been based on people wanting to see the main six matches last night. For the weekend, the Manny Pacquiao vs. Adrien Broner fight had two million searches which was the most of anything for the weekend. The UFC show totalled 1.6 million with 1 million for the show itself, 500,000 for Greg Hardy and 100,000 for Donald Cerrone. Paige VanZant also had a high number but didn't crack the top 20 yesterday. UFC was the second biggest search topic of the weekend. 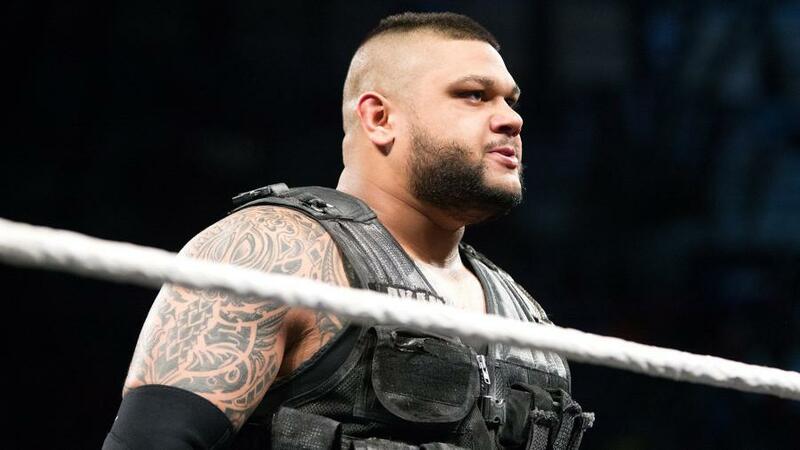 Akam (Sunny Dhinsa) underwent knee surgery this past week and will be out of action for two months, which is why AOP has disappeared. The Revival were sent on the road in their place on the Raw house shows. 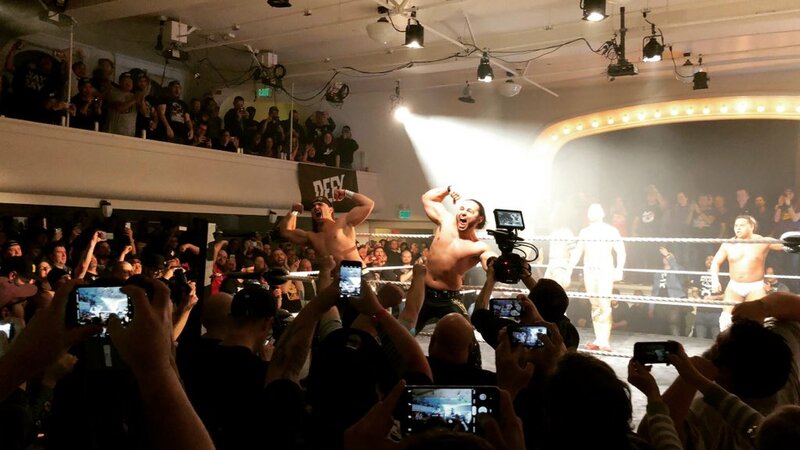 The Young Bucks made a surprise appearance last night at the Defy Wrestling show in Seattle that SCU was performing on. They superkicked several guys and did a Meltzer driver. Moose also showed up as a surprise, beating Jack Cunningham. MLW announcer Rich Bocchini was there, although he was advertised. Artemis Spencer beat Dezmond Xavier to keep the Defy title, Royce Isaacs & Jorel Nelson b The Amerikan Gunz to win the tag title, King Khash won the Defy to Survive ten man, Robbie Eagles b Cody Chhum, and Team Defy of Shane Strickland & Randy Myers & Schaff b Christopher Daniels & Frankie Kazarian & Scorpio Sky. The next show is 2/9 in Portland, OR and then 3/8 in Seattle. Matt Hardy wrote that he has rehabilitated and will be returning to the ring and said he's in his best shape in a long time and the lightest he's been in 20 years. Becky Lynch talks the Royal Rumble. The Bella Twins will be on Jimmy Fallon on Friday night promoting Total Bellas. Ric Flair will be hosting a Super Bowl party from 1-5 PM. on Super Sunday at the Hard Rock in Atlanta. There were two WWE references last night on Saturday Night Live. In a sketch about Millennials and Baby Boomers, WrestleMania was referenced. Kate McKinnon also made a reference to the Monday Night War on the Weekend Update segment while impersonating Elizabeth Warren. Progress Results from today in London: Ilja Dragunov b Timothy Thatcher, Nina Samuels b Laura DiMatteo, Drew Parker & Spike Trivet b Eddie Dennis & Mark Haskins, Angelico b Jody Fleisch, Mark Davis & Kyle Fletcher b Chuck Mambo & Pastor William Eaver, Chris Ridgeway b Shigehiro Irie, Will Ospreay & Paul Robinson b Chris Brooks & Kid Lykos to keep the tag titles. Lykos suffered a legit dislocated shoulder at the end of the match. Next show at the Electric Ballroom in Camden, London is 2/24. Tickets go on sale on 1/28. Hamilton Pro Wrestling on 2/9 in Hamilton at the Dom Polski Hall. Blackcraft & Destiny on 2/23 at the Don Kolov Arena at the Battle Arts Academy with John Hennigan, PJ Black, Michael Elgin, Josh Alexander, Dave & Jake Crist, Fallah Bahh, Ace Austin and Simon Grimm. SWF on 2/9 at Elks Lodge #2111 in Passaic Valley. Stardom from Saturday in Tokyo: Saki Kashima & Alex Gracia won three-way over Kaori Yoneyama & Ruaka and Rina & Hina, Momo Watanabe & AZM & Konami b Jungle Kyona & Natsuko Tora & Saya Iida, Hana Kimura & Sadie Gibbs & Bobbi Tyler b Mayu Iwatani & Tam Nakano & Starlight Kid, Utami Hayshishita b Hanan, Hazuki & Natsu Sumire b Kagetsu & Jamie Hayter. House of Glory Wrestling on 2/9 in Queens, NY at Club Amazura has LAX vs. Pentagon Jr. & Rey Fenix, Jordynne Grace vs. Sonya Strong and Sami Callihan appears. Smash Wrestling is taping for The Fight Network on 3/31 in London, ONT at the London Music Hall with Speedball Mike Bailey vs. Kevin Bennett. A show called Luv Hurts is on 2/9 in Cornwall, ONT at the Nav Centre headlined by Sheldon Jean vs. Josh Alexander. James Storm is working for Hunter Valley Wrestling on 3/23 in New South Wales, Australia. Shine from yesterday in Queens, NY: Dementia D'Rose b Trish Adams, Allie Recks b Brandi Lauren, Priscilla Kelly b Santana Garrett in a street fight, Luscious Latasha & Gabby Gilbert b Thunder Rose & Holidead to win the tag titles, Aja Perera b Keira Hogan to keep the Nova title, Jordynne Grace NC LuFisto in a no holds barred match, Allysin Kay b Ivelisse. Next show is 3/16 at Club LaBoom in Queens, NY. All Star Wrestling on 1/26 in Surrey, BC at the Cloverdale Fairgrounds. Eli Drake and Taya Valkyrie will be in Las Vegas on Wednesday and Thursday appearing at the SHOT Show at the Sands Expo Center. It's the largest trade show for target shooting, hunting, outdoor and law enforcement products. They will both be appearing in the Pursuit Channel booth. Sunday, April 6th, at 12:00 pm: Empire lunch (all you can eat) at Churrascaria Plataforma ($90 per person), located at 316 W. 49th street in Manhattan. Purchase tickets here~! Luxury Bus to MetLife Stadium for Wrestlemania: We will depart from the Hilton Midtown (site of Wrestlecon) located at 1335 Avenue of the Americas. Departure time is 4:00 pm and will return from MetLife approximately 30 mins after the event. Times are subject to change, and cost $67.00 per person for the round trip. Purchase tickets here~! Support the Empire~! with F4W shirts. Grab yours today!